Khorramabad International Airport( IATA : KHD, ICAO : OICK) is an airport in Khorramabad, Iran. An IATA airport code, also known as an IATA location identifier, IATA station code or simply a location identifier, is a three-letter code designating many airports around the world, defined by the International Air Transport Association (IATA). The characters prominently displayed on baggage tags attached at airport check-in desks are an example of a way these codes are used. The ICAOairport code or location indicator is a four-letter code designating aerodromes around the world. 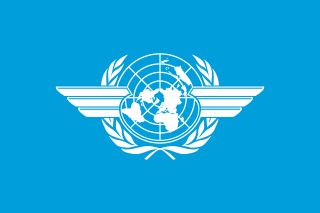 These codes, as defined by the International Civil Aviation Organization and published in ICAO Document 7910: Location Indicators, are used by air traffic control and airline operations such as flight planning. Khorramabadpronunciation (help·info) is a city and the capital of Lorestan Province, Iran. At the time of the 2006 census, its population was 328,544, in 75,945 families. Khorramabad is situated on the Zagros Mountains. Khorramabad Airport is 3 km south of the city proper. In mid-1943, during the Second World War, the Allies fled to the military camp of Badrabad, the headquarters of combat and military forces of Hindi, English, and American, and Khorramabad's runway was 20 meters long and was used for 1800 meters. It was used only for military aircraft. At that time, the runway was earthy. After the end of the Second World War, airplanes transported a family of military officers from Khorramabad to Tehran once a week. Until the National Iranian Oil Company and Lorestan Telecommunication Company purchased and restructured the airport land. Approximately 1800 m bands were paved for use on small postal aircraft, and a small guard room and a small building were built to rest passengers. At that time, Mohammad Reza Shah came to Khorramabad to open the transmission line and ordered the oil minister Manouchehr Iqbal to buy the land around the airport and move the Misigal Village near the airport to a more distant place. Shanghai Hongqiao International Airport is one of two international airports of Shanghai and an important airline hub of China. Hongqiao Airport mainly serves domestic and regional flights, with limited international flights. It is located near the town of Hongqiao in Changning District, 13 kilometres (8.1 mi) west of downtown, and is closer to the city center than Shanghai Pudong International Airport, Shanghai's main international airport. American Airlines Flight 1420 was a flight from Dallas-Fort Worth International Airport (DFW) to Little Rock National Airport in the United States. On June 1, 1999, the McDonnell Douglas MD-82 operating for Flight 1420 overran the runway upon landing in Little Rock and crashed. Eleven of the 145 people aboard, the captain and ten passengers, were killed in the crash. Hamid Karzai International Airport is located 5 kilometers (3.1 mi) from the city center of Kabul in Afghanistan. It serves as one of the nation's main international airports and as one of the largest military bases, capable of housing over one hundred aircraft. It was previously named Kabul International Airport and locally as Khwaja Rawash Airport, though it continues to be officially known by some airlines by the latter name. The airport was given its new name in 2014 in honor of former President Hamid Karzai. The decision was made by the National Assembly of Afghanistan and the Cabinet of President Ashraf Ghani. Tehran Imam Khomeini International Airport, is the primary international airport of Tehran, the capital city of Iran, located 30 kilometers southwest of Tehran, near the localities of Robat Karim and Eslamshahr and spread over an area of 13,500 hectares of land. Along with Mehrabad International Airport, Imam Khomeini Airport is one of the two international airports serving Tehran. All International flights in Tehran are currently served by this airport and all domestic flights are served by Mehrabad Airport. the airport has served about 9 million international passengers. 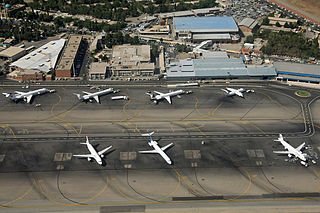 It ranked 3rd in terms of total passenger traffic in Iran after Tehran Mehrabad Airport and Mashhad Airport. The airport is operated by the Iran Airports Company and is one of the home base of Iran's international airlines, Iran Air, Mahan Air and some other. Bergen Airport, Flesland is an international airport located at Flesland in Bergen, a city and municipality in Hordaland county, Norway. Opened in 1955, it is the second-busiest airport in Norway, with 6,306,623 passengers in 2018. Flesland is operated by the state-owned Avinor. Until 1999 Flesland Air Station of the Norwegian Air Force was co-located at the airport. Iran Aseman Airlines is the third-largest Iranian airline headquartered in Tehran. It operates scheduled domestic passenger services and regional international services. Mehrabad International Airport, is a joint airport and was one of the two international airports serving Tehran, the largest city in Iran. Until 2007 and before construction of the new airport for the city, Mehrabad was Tehran's primary airport in both international and domestic traffic, but after 2007 International flights transferred to Imam Khomeini International Airport. All International flights in Tehran are currently served by Imam Khomeini International Airport and all domestic flights are served by this airport. Although only domestic flights are served by this airport, in 2016 Mehrabad Airport handled 16,678,351 passengers and was the busiest airport in Iran in terms of passengers. The airport is also used by the Government of Iran and is one of the bases of the Iranian Air Force. Flamingo International Airport, also called Bonaire International Airport, is an international airport located near Kralendijk on the island of Bonaire in the Caribbean Netherlands. It was the once the hub for BonaireExel and CuraçaoExel before being rebranded as Dutch Antilles Express and served as a secondary hub for Dutch Antilles Express and Insel Air. The airport is the third largest in the Dutch Caribbean, after Princess Juliana International Airport on Sint Maarten and Curaçao International Airport on Curaçao. Zamboanga International Airport (Chavacano and Spanish: Aeropuerto Internacional de Zamboanga is the main airport serving Zamboanga City in the Philippines. The airport is Mindanao's third-busiest airport after Francisco Bangoy International Airport in Davao City and Laguindingan Airport in Cagayan de Oro City. The airport covers a total land area of 270 hectares. Podgorica Airport is an international airport serving the Montenegrin capital of Podgorica and the surrounding region. It is one of two international airports in Montenegro, the other being Tivat Airport. Both are operated by the state-owned company Airports of Montenegro. Svalbard Airport, Longyear is the main airport serving Svalbard in Norway. It is located 1.6 nautical miles (3 km) northwest of Longyearbyen, and is the northernmost airport in the world with scheduled public flights. The first airport near Longyearbyen was constructed during World War II. In 1959, it was first used for occasional flights, but could only be used a few months a year. Construction of the new airport at Hotellneset started in 1973, and the airport was opened on 2 September 1975. It is owned and operated by state-owned Avinor. Kirkenes Airport, Høybuktmoen is an international airport located at Høybuktmoen, 15 kilometers (9 mi) west of the town of Kirkenes, in the municipality of Sør-Varanger, Finnmark county, Norway. Operated by the state-owned Avinor, the airport has a single 2,115-by-45-meter asphalt runway numbered 06–24. Scandinavian Airlines and Norwegian Air Shuttle operate Boeing 737-services to Oslo Airport, Gardermoen, in part generated by Høybuktmoen's function as a hub for Widerøe's regional services to other airports in eastern Finnmark. There are also summer charter flights to Central Europe to bring tourists to the Hurtigruten cruises. The airport had 297,149 passengers in 2013. Ny-Ålesund Airport, Hamnerabben is an airport serving the research community of Ny-Ålesund in Svalbard, Norway. The airport is owned by Kings Bay, who also owns the company town. The only flights available are to Svalbard Airport, Longyear, operated two to four times a week by Lufttransport using Dornier Do 228 aircraft. The services are organized as corporate charters and tickets are only available after permission from Kings Bay. Birjand Airport is a small airport near Birjand, Iran. Due to the geopolitical eminence of Birjand in the eastern parts of Iran, Birjand airport started operation in 1933 as the 3rd operational airport in Iran. Birjand airport offers non-stop daily flights to Tehran and Mashhad. Berlevåg Airport is a regional airport serving Berlevåg Municipality in Finnmark county, Norway. The airport is situated 2 kilometers (1.2 mi) northwest of the village of Berlevåg and is owned and operated by Avinor. The airport has a 880-meter (2,890 ft) runway aligned 06/24. Services are provided by Widerøe using Dash 8-100 aircraft to other communities in Finnmark. The airport served 5,921 passengers in the terminal and received the most subsidies per passenger of any Avinor airport. A further 8,948 landed and started at the airport without leaving the aircraft. Asiana Airlines Flight 733 was a domestic Asiana Airlines passenger flight from Seoul-Gimpo International Airport to Mokpo Airport (MPK), South Korea. The Boeing 737 crashed on July 26, 1993 in the Hwawon area of Haenam County, South Jeolla Province. The cause of the accident was determined to be pilot error leading to controlled flight into terrain. 68 of the 116 passengers and crew on board were killed. Vietnam Airlines Flight 815 was a scheduled Vietnam Airlines flight from Ho Chi Minh City to Phnom Penh's Pochentong Airport. The Tupolev Tu-134B-3 aircraft crashed on final approach approximately 800 meters (0.5 mi) short of the runway, killing 65 of the 66 persons on board. The aircraft was completely destroyed. TWA Flight 427 was a regularly scheduled TWA passenger flight departing Lambert-St. Louis International Airport (STL) in Bridgeton, Missouri on November 22, 1994, operated using a McDonnell Douglas MD-82. On the takeoff roll it struck a Cessna 441 Conquest II, killing both of its occupants. It was the second of two flights numbered 427 that would be involved in an incident that year, the other being USAir Flight 427, which crashed in September near Pittsburgh, Pennsylvania killing all 132 on board. Asiana Airlines Flight 162 was a regular short-haul international passenger flight from Incheon International Airport near Seoul, South Korea, to Hiroshima Airport in Hiroshima, Japan. On 14 April 2015, the Airbus A320-232 aircraft touched down short of the runway, struck the localizer array, skidded onto the runway on its tail, and spun 120 degrees before finally coming to a rest on the grass, opposite the terminal building. The aircraft suffered substantial damage to the left wing and engine. Of the 82 people aboard, 27 were injured, one seriously. This article about an Iranian airport is a stub. You can help Wikipedia by expanding it. This Khorramabad County location article is a stub. You can help Wikipedia by expanding it.